Urban Sketchers Seattle: Capital Hill Treasure! 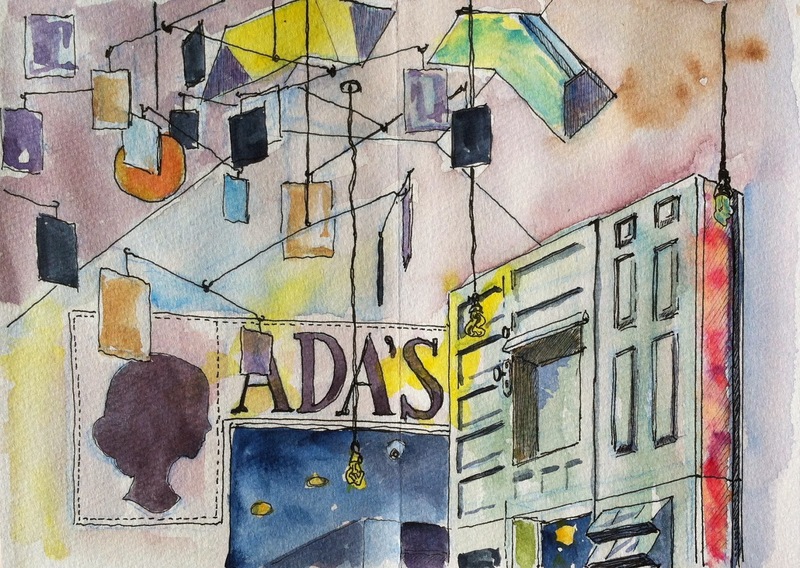 The Friday ad hoc group of Urban Sketchers met this morning at ADA'S Technical Bookstore and Cafe. What a great find!! Located right on 15th Ave. in Capital Hill, next to Coastal Kitchen, Ada's now occupies the old ramshackle house/bookstore once called Horizon Books. Before Ada's took over, the entire house had a much-needed make-over. And for a sketcher (or a techy nerd,) Ada's is full of "treasures." Each table in the cafe part is actually a deep wooden frame-case, covered with clear glass. Inside the case sits a collection of padlocks, or a collection of slide-rulers, or an antique telescope and guide to the stars. One long table contains at least a a couple hundred compasses!